Many of Cubase's older MIDI plugins are no-nonsense tools that can tidy up inconsistencies directly 'on the channel'. Correcting the MIDI information directly inside the event itself would be a destructive process, requiring several undo steps to revert back to the original performance. By applying real-time MIDI processing, you can bypass and re-order plugins, keeping the original MIDI file still intact. It's also easier to experiment with different quantise/swing settings, velocity variations and note length adjustments. For more on MIDI processing, pick up Future Music 289, on sale now. 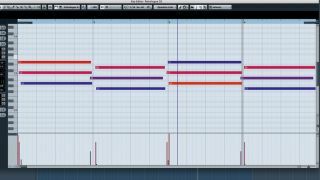 Step 1: Here's a basic chord progression that's been recorded to a MIDI file. As you can see, the notes' timings and velocities vary wildly. While some natural expression is often a good thing, we need to correct this sloppy performance. Step 2: In Cubase's first MIDI Insert slot, we've loaded a Quantizer effect. As the name implies, this quantises MIDI notes to a user-defined timing - although, unlike applying quantisation settings destructively inside the piano roll, this effect works in real time. Step 3: Next, we use a Compressor effect to even out the notes' differing velocity values, in exactly the same way as a regular audio compressor would. Our notes are now more consistent, with each having a more even level in comparison to one another. Step 4: Our performance has been corrected, but non-destructively so we can mute or change the MIDI inserts' settings to fine-tune our adjustments. Now that we're happy with the alterations, we've arpeggiated the chords' notes using Cubase's Arpache SX effect.